Join our Group Ski Holiday next January. ski in 4 different countries. Above all, you will be able to ski in a different ski area every day! Ski or board in some the largest and varied ski regions in the world. Why join a group ski holiday? 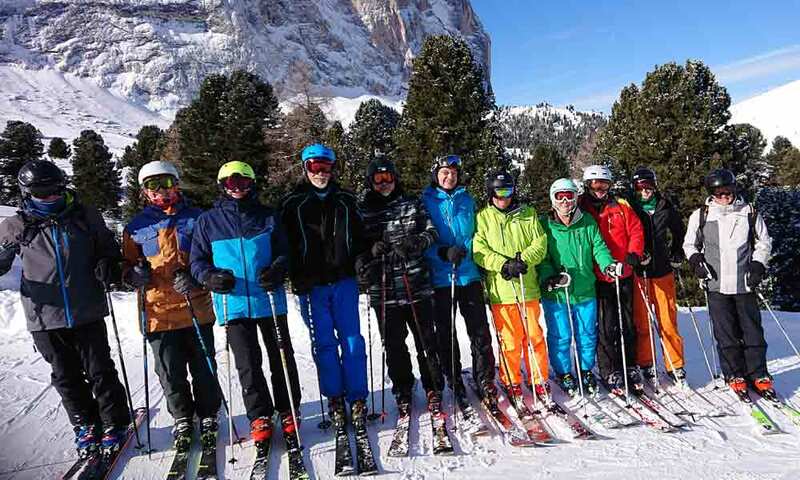 Join our next Europe Group Ski Tour and Holiday to the high alps of Europe and the Italian Dolomites in 2020. A three week ski holiday to France, Austria and Italy. This group ski holiday is a group ski package which travels across Europe over 3 weeks. AS a result, you will ski in some of the most famous ski areas Europe has to offer. You will stay in 3 and 4 star centrally located hotels which ensures minimum hassles and maximum convenience. This group ski holiday starts on 3 January ’20 with one night pre tour accommodation in Geneva, Switzerland. You will then travel to Morzine in France for your first week. Here, ski the areas of Morzine, Les Gets & Avoriaz on the French side or Les Crosets, Morgins Champery and more on the Swiss side. In the second week, stay in Lech (Austria) and ski Lech and the interconnected areas of Zurs, St Anton, Warth, Zug and Stuben. Follow this up with a week in the Italian Dolmites, based in the village of Val Gardena. The tour ends at a Milan Malpensa airport hotel on the 25th Jan ’20 with one night post tour accommodation. See full itinerary here. The ski resort hotels offer a range of room types, from standard to comfort, deluxe or suites. So book early to get your preferred room type. These group ski holidays are the total package. All the ski resorts on this tour have modern lift infrastructure, but still retain the characteristics of the traditional village. There are fantastic ski slopes combined with spectacular scenery and a variety of charming European culture. Experience all of this together with the convenience of a Group ski trip to Europe. You can utilise these ski Europe holiday packages as described, or tailor these group ski tours to suit your own travel itinerary. Estours Travel has been conducting these Europe ski holidays resorts every year since 1983. You will leave with a memorable skiing or boarding experience. Book early as numbers are strictly limited on these tours. The best airfare options are available now. Once sold out …then there is always 2021. Accommodation: 1 night pre tour accommodation in Geneva. Double & twin share 3 & 4 star accommodation in the ski resorts (various room standards available)… Hotel le Sporting in Morzine, Hotel Sandhof in Lech, and Hotel Aaritz in Val Gardena. These hotels are located close to lifts or shuttle bus stops. Importantly, you are within easy reach of Apres ski activities. 1 night post tour at Milan airport hotel. Meals: Breakfast at overnight pre & post tour accommodation, and breakfast and dinners in Morzine, Lech and Val Gardena. Ski Lift Tickets: 6 day all area Porte du Soleil ski pass, an Arlberg region ski pass for Lech/Zurs/St Anton/Warth and a Dolomite Superski pass in Val Gardena. Transfers: All land transfers between resorts and hotels in chartered air conditioned coaches with private and exclusive use for these groups (3 week tour & subject to group minimum numbers being achieved). Local Taxes: All local taxes & hotel service charges. Group Leader: Fully escorted from meet & greet night until return departure from ski resort. Top Ski Resorts: World renowned French, Swiss, Austrian and Italian ski resorts, suitable for beginner to expert. Hassle and Stress Free – Estours has been conducting these tours for over 30 years. As a result, we put together a smooth integrated ski tour with all the essentials included. So, all you need to do is just relax and enjoy your ski holiday. Meet new (like minded) skiers and boarders. Don’t worry about not knowing anyone! Remember they are there for the same reason to have a great time with people who are keen to share the fun and excitement with you. Certainly, you won’t want the group ski holiday to finish. You will enjoy great times full of fun and entertaining moments amongst great friends. In short, you will want to come back each year for more. Door to Door convenience. Getting to different ski resorts in different countries in Europe is tricky with public transport. It is expensive in private transfers or hire cars. However, it is extremely convenient in our privately chartered coach. Once on tour, you do not need to worry about what happens or where do I go next and how do I get there? More time on slope. Everything organised for you. Consequently, you will have more time to spend on the slopes. Your Tour Leader/s have been there and done that. In short, we have planned an exciting and fun ski holiday group tour that works for all ages, abilities and interests. Morzine is a thriving Alpine village set deep in the Chablais mountain range between Lake Geneva and Mont Blanc, by the France-Switzerland border. It’s roots as an old French farming and mining town are apparent in the village today, where local produce is available at the weekly market, and many of the chalets sport local slate roofs. Morzine is just over an hour’s drive from Geneva Airport. It is located the middle of one of the biggest ski areas in the world – the Portes du Soleil ski domain. Certainly, Morzine’s ski area is filled with cruisy, tree-lined blue and red runs. Further, it’s also linked directly to the ski resorts of Avoriaz and Les Gets. The village lift network of lifts reaches the panoramic Chamossière at 1800 metres, and Avoriaz, at 2100 metres. The low level traditional chalet-style buildings in Morzine help preserve the town’s character and charm. As a result, this style of accommodation, along with the attractive skiing, provides the quintessential ski holiday experience. Consequently, Morzine is a firm favourite with families and groups of friends. In the last few years, Morzine has invested in new lifts and sports facilities. Furthermore, new bars, and high quality restaurants have also begun to emerge, allowing Morzine to compete favourably with many of the big-name resorts in the Alps. With access to 426km of pistes, great quality accommodation and buzzy nightlife, Morzine is one of our favourite ski resorts. Lech, Zurs, St Anton, Warth. The Arlberg ski region is the largest single ski region in Austria. We will stay in Lech and have access to all the ski areas of Lech, Zurs, St Anton, Warth, St Christoph, Stuben and Zug. Your Arlberg ski pass covers a total of 97 cable cars and lifts, 340 kilometres of ski runs and 200 kilometres of high Alpine deep powder snow runs. In Lech Zürs nothing stands in the way of true enjoyment on the pistes, and there are numerous rustic huts and “Alps” to keep hunger at bay. Moreover, world-famous hospitality, tradition and sophisticated tranquillity have been attracting winter sports enthusiasts from all over the world for at least a century to this Eldorado of winter sport. Lying between 1,450 and 2,450 metres above sea level, the Arlberg region is one of the distinguished circle of 12 locations dubbed “Best of the Alps”. But it’s not only those with sporting ambitions who get their money’s worth in this heavenly winter landscape, because there is also something on hand for walkers, gourmets and culture lovers in the winter season, which runs from December to April. And, while here, why not try the White Ring Circuit – the course of the longest ski race in the world. This ski circuit between Lech, Zürs, Zug and Oberlech is unique in the Alps and has been celebrating skiing in a special kind of way for over 55 years. The original cable cars, lifts and pistes of the “White Ring” still form the centrepiece of the magnificent skiing area of Lech Zürs am Arlberg. The new lift connecting Zurs to the Rauz area allowing you to ski between the resorts of Zurs and St Anton eliminates the need to catch the town ski bus to get to and from St Anton. at your disposal under the one ski pass. Here you can go ski touring and explore this large area even if you haven’t been here before. Try the Sellaronda circuit. On the Sellaronda itinerary you can ski around the imposing Sella Group in only one day: this means 26 km of slopes, 4 valleys and three provinces with one single skipass. Plan for 6 hours excursion and pay attention to getting the last ski-lift in the afternoon (slopes close at 5 p.m.). Ski on the Sellaronda clockwise and counter-clockwise. And the nightlife here is plentiful with many apres bars open to the wee small morning hours. Contact one of our friendly consultants who will be more than happy to discuss your ski holiday plans. They will explain all about our group ski tours and answer any of your questions (02) 4284 1688. Situated in the heart of the Portes du Soleil, at the bottom of the ski slopes and at 300 m from the Pleney cable car and skischool, the Hotel Sporting is ideally placed so as to assure you a pleasant stay in Morzine. The hotel has been kept by the Passaquin family for the last three generations. 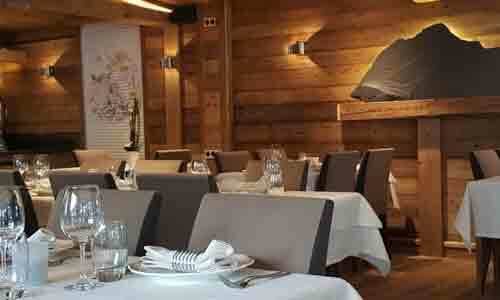 As a result, this chalet will allow you to plunge into a typical savoyard atmosphere. All rooms are accessible via a lift and all offer brilliant comfort and WiFi access. The well-equipped rooms are decorated in a chic and cosy mountain style, combining fine materials and the warmth of wood furnishings. So, this creates a warm and cosy environment. They also all come with a balcony. The hotel has a heated indoor / outdoor pool, and the rooms are equipped with bath or shower, toilet, hairdryer, flat screen TV with foreign satellite programmes telephone and WiFi. Enjoy the extensive breakfast buffet in the mornings and a 5-course evening meal (choice of main course) with salad bar and cheese board. Once a week there is a romantic Fondue Bourguignonne and also once a week an Austrian evening with live music. The family owners will delight you with Austrian and regional specialities. In particular, their delicious menu is rounded off by home-grown products, vegetarian meals and – of course – a variety of international specialities. The tour is costed on standard double rooms. Upgrades to twin comfort, deluxe and junior suites are available. 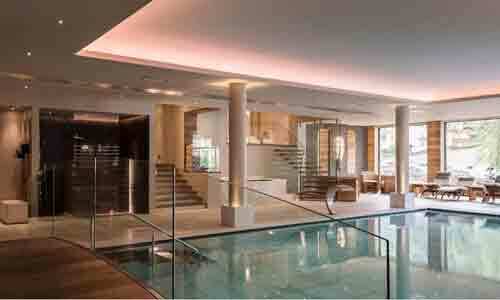 This hotel is probably the best located hotel in Val Gardena, diagonally opposite the Ciampinoi lift. 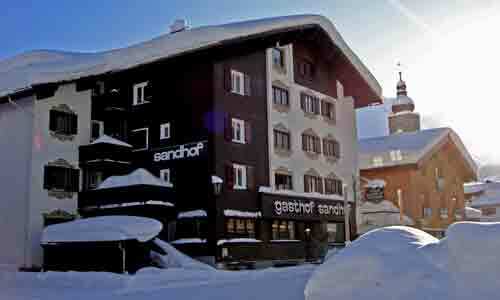 Certainly, the most convenient hotel in Val Gardena. You will have access to an indoor swimming pool, sauna, turkish bath, infrared sauna, whirlpol, solarium, fitness room and more. The rooms have a bath or a shower, WC, safe, hairdryer, TV, Wifi, a telephone and most have a balcony with panoramic views. Download booking form complete and send to Estours Travel or book online. * The ski tour cost is a per person for land content only. The cost is based on a twin / double share arrangement, utilising a mix of standard, comfort and superior hotel rooms. Space is limited for each room type. Once standard rooms are sold, upgraded room prices will apply. Contact Estours for latest pricing which may reflect variations in currency exchange rate. Single rooms have limited availability. Should you wish to be a single traveller, we may offer double rooms for single person use (contact Estours for availability). Price quoted is in Australian Dollars, based on currency exchange rate at 5 February 2019. Price may alter with changes in currency exchange rates or services supplied. The group leader is subject to minimum group numbers being achieved.